Don't expect to hear more about an Obamacare surcharge from Denny's franchisee John Metz. Denny's chief executive John Miller privately reached out to Metz to express his "disappointment" with the Florida franchisee's controversial statements about Obamacare, which sparked a wave of backlash for the national restaurant chain over the past few days. Metz released a statement Monday night expressing "regret" over his statements. "We recognize his right to speak on issues, but registered our disappointment that his comments have been interpreted as the company’s position," Miller said in an email to The Huffington Post. Miller is rushing to put out the fire sparked by Metz's controversial proposal to charge restaurant customers a 5 percent Obamacare fee. "Customers have two choices: They can either pay it and tip 15 or 20 percent, or if they really feel so inclined, they can reduce the amount of tip they give to the server," Metz told HuffPost in an interview last week. Some Denny's franchisees have since dealt with angry customers, calls for a boycott and declining sales. A spokeswoman for Metz said he will not conduct more interviews. Metz, whose RREMC Restaurants owns more than 30 Denny's locations, said in a statement, "We regret that the statements we made may have been interpreted as representative of the Denny’s brand or of other franchisees, which they are not. Our stores do not have a 5 percent surcharge. Despite recent media coverage, RREMC Restaurants is committed to exploring viable and effective ways to deal with the changing economic climate, including the implementation of The Affordable Care Act. We have always been and will continue to be 100 percent dedicated to our employees and customers and will work tirelessly to find solutions that are in their best interests. It is our intention is to fully comply with the law." After Metz's original comments went viral, Abdo Mouannes said sales and traffic dropped "overnight" at his seven Denny's locations in Florida. Angry callers immediately jammed the phones at his restaurants. "The manager said it was so frustrating, she wanted to unplug the phone," Mouannes told HuffPost. "People didn't like what they heard and were saying they wouldn't support Denny's, but we have nothing to do with that decision. I am not a fan of the idea. We are opposing the 5 percent [surcharge] -- it's not even a consideration for us." Mouannes, who co-owns the restaurants with this brother, said he would never have laid off employees or cut hours due to Obamacare. But now he may have to, he said, if Denny's boycotts take hold. "I'm not in favor of cutting employees, but if there is no demand, we will be pushed to do this," he said. "Unfortunately, if there are boycotts, it's going to come down to hurting our operations, hurting our employees. There will be people hurt across the board." Unfortunately for Mouannes, many consumers don't understand the complex relationship between franchisees and their parent corporations, or that owners of individual outlets within Denny's, Ace Hardware, Applebee's, Papa John's and Jimmy John's may not represent the whole company when speaking against Obamacare. Franchises expand by selling their operating systems and brand rights to independent business owners, who become franchisees and must abide by those systems. For example, entrepreneurs can buy a McDonald's franchise, but not a Starbucks, which has expanded through non-franchised, company-owned units. "When you walk into a Denny's, it sure looks and smells like a corporate restaurant, but it's not," said Joel Libava, franchise advisor and founder of TheFranchiseKing.com. "The biggest minus [to being part of a big brand] is a rogue franchisee deciding to jump into the political fray or do something that goes viral and affects the whole system. Someone in West Palm Beach, Fla., can affect someone in Boise, Idaho, who has nothing to do this this surcharge." Mouannes struggled to explain the distinction to Denny's customers expressing disapproval and threatening to boycott, he said. Only about half of his customers understood that he was an individual franchise owner whose business decisions were unrelated to Metz's, while the others "were still in confusion and not satisfied," he said. Denny’s Corp. is also trying to protect its brand and other franchisees by publicly distancing itself from Metz's statements. "While we respect the decision of an independent business owner to speak out on this or other topics and express their personal views, his statements do not capture the respect by Denny’s, the Denny’s Franchisee Association or our franchise community at large for our hardworking employees or for our valued customers," John Miller, CEO of Denny's Corp., said in a statement. "Unfortunately, the comments of this franchisee, who represents less than 1 percent of our system and who owns restaurants in other concepts, has been portrayed as reflective of the entire Denny’s brand," Miller said. "I am confident his perspective is not shared by the company or hundreds of franchisees/small business owners who make up the majority of the Denny's community. Specifically, his comments suggesting that guests might reduce the customary tip provided to their server as an offset to his proposed surcharge are inconsistent with our values and approach to business throughout our brand." As for consequences to those who damage the brand, a Denny's spokesperson said, "We have a variety of options depending on the circumstances to respond to franchisee actions that are not in the best interests of the brand and deal with those on a individual franchisee basis as required." There may also be fallout in franchising beyond the Denny's system, as potential franchisees become wary of buying into brand names due to the "politics and noise" from franchisors and franchisees, Libava said. "Most people get into franchising to be their own boss, not to get into the middle of something political," he said. "I have a feeling that some of the bigger franchise law firms are thinking about ways both parties can be protected against this." Libava added that "it doesn't help that the biggest franchise association in the world, [the International Franchise Association], is getting into politics as well. It sets a precedence." The International Franchise Association's public opposition to Obamacare was based on analysis and feedback from franchisor and franchisee members, leading the trade organization to conclude it "was misguided public policy that wouldn't result in better health care, but in job loss and a dramatic impact on the industry," Judith Thorman, the group's senior vice president for government relations and public policy, told The Huffington Post. "I hope people still have ability in this country to speak out on the impact of public policy issues on their businesses," Thorman said. "That's all they're really trying to do is to say this policy will have a dramatic economic impact. We may not all agree, but I think it's good if everyone comes forward with their opinion, and that we have a dialogue on it." 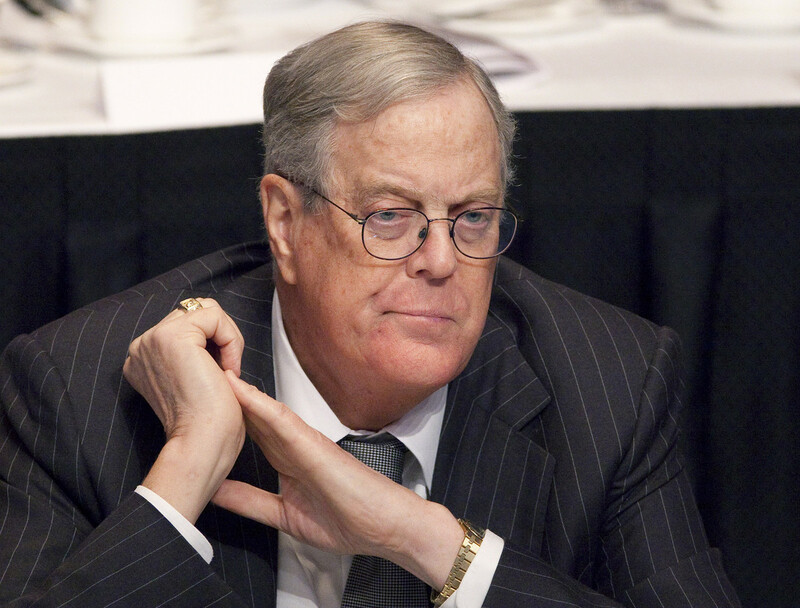 The Koch Brothers are known for being outspoken supporters of right-wing politicians. They have <a href="http://www.newyorker.com/reporting/2010/08/30/100830fa_fact_mayer">donated millions of dollars</a> to Republican campaigns, and now they are trying to influence votes in a new way: by <a href="https://www.huffpost.com/entry/koch-romney-brothers-mitt_n_1965366">emailing 50,000 of their employees</a> urging them to vote for Romney.